What’s better than one horror tweet by tweet review to start off a horror filled weekend? Well two horror tweet by tweet reviews, of course. Tim Schilling, our resident Twitter reviewer, is back with a double feature of one of the great zombie double features of all time “Return of the Living Dead” & “Return of the Living Dead II.” Tim is a HUGE zombie fan but do these 80’s zombie comedies slay him? Let’s find out..
0:05 This might be the only zombie movie ever made where people have actually heard of zombies beforehand. 0:08 Leak? Oh hell no! *BANG* cue the 80’s music. 0:14 Such an awesome cemetery. 0:16 Yeah, deodorant, that’ll do it. 0:18 Lololol that vision test on the wall says ‘Burt is a slave diver’ I’ve never noticed that before! 0:20 Dancin naked in the graveyard. 0:26 Damn zombie making such a ruckus. 0:28 Such a strange group of friends. 0:37 Whenever something bad happens, awesome music starts playing. 0:44 I love tar man. BRAINS! Brains! 0:53 These zombies are pretty good at sneak attacks. 0:55 Woooo go midget zombie! 1:04 The scene when they’re talking to the girl zombie is pretty creepy. 1:08 Over acting is perfectly okay in this movie. 1:16 Zombies have feelings too you know. 1:25 The answer to everything is nukes. 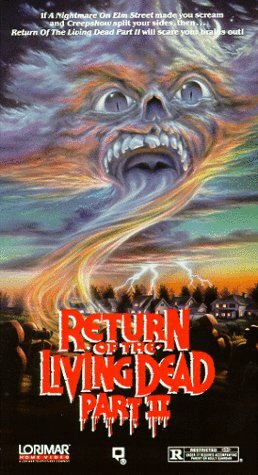 I don’t think I need to explain that I absolutely love #ReturnOfTheLivingDead. There isn’t a single thing wrong with the movie. It’s way too much fun to hate. And as always: the 80’s rock. 0:04 Spider-Man comic, nice choice. 0:13 I don’t know why I like the setting of this movie. A housing complex under construction. So random. 0:18 It reminds me so much of Creepshow when the kid is in his room reading comics. 0:22 I love tar man. I think I said that last night too but whateva. 0:28 I don’t know why, but I love the screams the zombies make in these movies. So funny. 0:39 Zombies need to stay in shape too you know. 0:45 Possibly the coolest doctor ever. 0:47 Everyone just yells at the kid, give him a chance! He actually knows what to do. 1:02 That poor pet store. 1:05 So rich and spicy! Spicy? Yeah! 1:10 Zombie what are you doing driving that car! 1:22 Fried zombie is my favorite. Coming soon to the Big E.
1:25 Screwdriver zombie how did you make it that far? That’s okay cause you’re hilarious anyways. I feel the same way about #ReturnOfTheLivingDead2 as I did the first. So funny, so much fun to watch, and just impossible to hate.